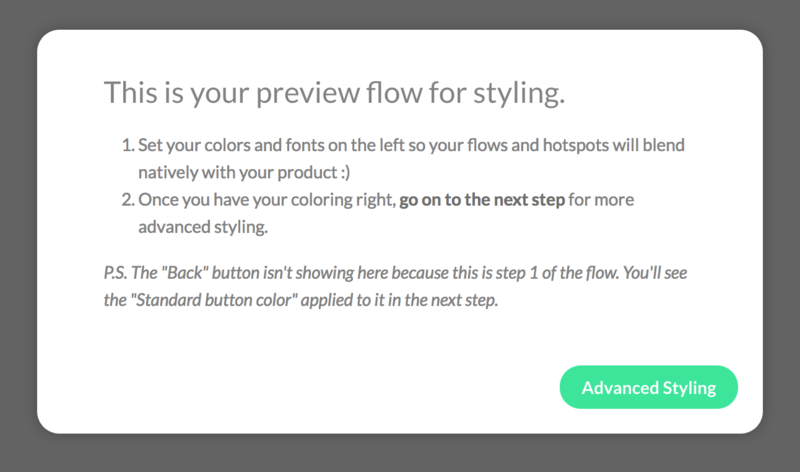 With a little extra CSS, you can enhance your modals and slideouts on top of the customization our basic style editor (located on your Themes page) supports. Copy, paste, and edit the snippets below to take your flows to another level. Please note that our markup is subject to change. While we test our own styling operators across browser versions, we are unable to guarantee that your custom CSS will operate as expected. ProTIp: Do not use body or html tags in the HTML component while building your flows, as it can cause your flow to break or not show when pushed live. Note: This will ONLY work for modals. This CSS will not have the same effect for Slideout patterns. Modals default to 650px wide. You Can Adjust the default width of modals to make them larger or smaller using the following code. Please note that there is an upper-limit to the size of modals. To circumvent this, change the "min-width" to the desired size as well, shown below. Sometimes, you want a consistent height for all modals or modal steps. To accomplish that, use the following. If you want to change the style of just modals, or just slideouts, without changing the other patterns, you can select each pattern specifically to modify its styles. appcues[data-pattern-type=modal] selects modals only, while appcues[data-pattern-type=shorty] chooses slideouts. You can then add style rules within those to apply only to slideouts or modals. Here are some examples. You can also change anything within a slideout or a modal, specifically for slideouts or modals. You can adjust the top padding of the appcues element to move it closer to the center. Note: To center a slideout, choose Centered for the position in the Flow Editor.